The factors which make Islamic State relatively straightforward to contain geographically are the same ones which make it nearly impossible to drive them from the lands they currently occupy. The group relies upon the often irreconcilable divisions between their enemies in order to survive, these divisions allow them to face each of their enemies on the ground in turn. I would suggest that the nightmare scenario for ISIS commanders, many of whom are experienced military men, is a war on multiple fronts. IS puts little stock in static defence, probably based on the assumption that to spread it's forces thinly along its borders would invite disaster. They realise that, in the words of Frederick the Great, "he who defends everything, defends nothing". It also tells us that the likelihood is that their army isn't nearly as large as some commentators suggest, they do not have experienced troops to spare for defensive action. Instead their strategy is to lightly defend their external borders. Using very small numbers of troops, suicide bombers and booby traps to harass and slow down their enemies. Importantly they do not attempt to blunt their attacks by fighting significant defensive actions. Again, they are probably right to do so. They likely judge that defending territory, even urban areas, in the face of Coalition air power is ill advised at best and suicidal at worst. Any fight where ISIS forces become pinned in place by enemy ground troops for more than a few days will likely result in disproportionate losses for the Islamic State, as the full weight of Coalition air power is brought to bear. We saw this happen when IS conducted protracted offensive action around Kobane. The experience of heavy losses in that battle: ~2000 fighters killed, an unknown number injured and 18 tanks destroyed, likely shaped their current mode of conducting operations. Their commanders understand that pushing against enemy strength, along a single axis, in order to seize an objective won't work. Instead they attack where their enemies are weakest. Short sharp offensives that take (or retake) ground at a low cost in the lives to their base of experienced fighters. By always holding the initiative, and an element of surprise, they continue to dictate the terms of the ground war; even when their enemies are on the offensive. While the group is committed to a strategy of continued offensive action, which keeps their enemies off balance and prevents them from gathering the forces for a decisive thrust into the Islamic State itself, it has not been able to repeat it's initial rapid advances. This is almost certainly because they are constrained, like all the other warring factions, by their inability to operate effectively outside areas populated by their own ethno-religious group. It's probable that one reason for their initial gains in Iraq was Islamic State's ability to exploit the human landscape in Sunni majority areas far more effectively than their opponents in the Shia dominated Iraqi army. This factor makes them far easier to contain territorially, because the same factor which enabled them to expand so quickly into the Sunni parts of Iraq now works against them when they try to advance into Shia or Kurdish majority areas. Containing the group in Sunni areas of Iraq and Syria has drawbacks though. In order to maintain the appearance of continuous offensive success they have begun parallel strategies of terror attacks on the West and the establishment of franchises outside their main territory. There are several important things we can infer from their behaviour, which will be essential in formulating a strategy to defeat them militarily. 1. Contrary to their own narrative they are acutely aware that they cannot sustain heavy casualties. This has led them to avoid protracted offensive action and to all but abandon the defensive as a viable option. 2. Their veteran field army is vital to their strategy, as it enables them to conduct effective offensive action. This prevents their enemies from concentrating enough force along a few axies of attack to seriously threaten their territory. 3. Their inability to make headway in non Sunni areas, south towards majority Shia Baghdad and North into Kurdish territory, is a product of the same forces which prevent Kurdish or Shia dominated Iraqi forces from making headway in the opposite direction. All the forces present in Iraq lack the ability to project their military power into areas controlled by different religious and ethnic groups, ISIS included. 4. ISIS rely on the divisions throughout the region and beyond it for their survival against conventional military intervention with ground forces. ISIS leaders likely know that the US will continue to veto Turkish intervention on the basis that it will likely be directed as much against their Kurdish allies as against IS. Many of the Gulf States and Saudi Arabia seem content to watch as Assad's Iranian ally is drawn ever deeper into the Syrian quagmire. Of course it goes without saying that Assad and the Free Syrian Army will continue to battle one another far more intensely than ISIS. 5. 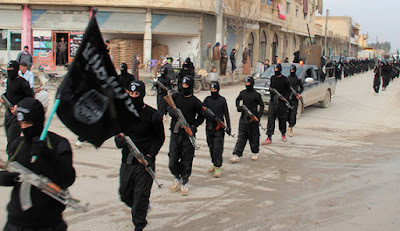 Containing IS is likely pushing the group to adopt a new strategy, which includes acts of international terrorism and spreading franchise groups, in order to maintain the appearance of effective offensive action. 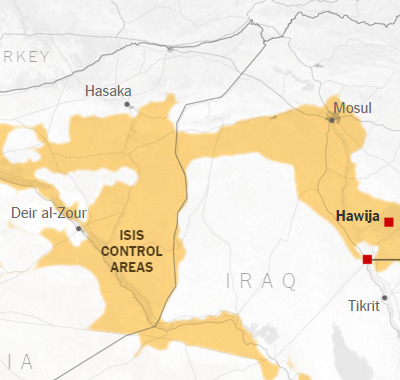 The ISIS field army is at the core of their strategy of continuous offensive action. With these deductions in mind, what would an effective strategy for defeating ISIS look like? Any such action would have to start with the premise of destroying, or so badly damaging, their field army that they cease to be capable of conducting meaningful offensive or counter offensive action. This is far easier said than done, Western troops would not be able to achieve this. The leadership of IS will undoubtedly have prepared contingencies for the introduction of conventional forces by a major military power. Their reaction would probably be to immediately disperse their forces and adopt a purely guerilla strategy of protracted resistance. This is unappealing because it makes the wholesale destruction of their trained manpower base a near impossibility over any acceptable time span. In order to be drawn into a conventional battle IS commanders must believe that they stand a reasonable chance of success. This means the main ground component will have to be drawn from at least one, but likely more, of the factions currently fighting on the ground. The fight to destroy IS' army cannot be a defensive action on the part of their enemies, so long as IS hold the initiative they remain free to break off costly offensive action and refocus their efforts elsewhere. Their army needs to be drawn into a battle they patently do not wish to fight, a protracted static defensive action, where coalition air power can be fully brought to bear against them. IS will not be forced to commit to such an action easily. It would probably require a land force threatening one of their major centers of power, Raqqa or Mosul, in order to force them to commit to a static defensive action in a single location. Their leaders will almost certainly understand the difficulty of assaulting a city filled with determined defenders and calculate that they stand a reasonable chance of success. In an action against dug in ISIS forces holding a major city, coalition members must set aside many of their reservations about conducting strikes in urban areas. Civilians will die and IS may seek to keep as many of them in place as possible, to limit the effectiveness of air power by exploiting the squeamishness of Western populations when it comes to unintended collateral damage. Embedding forward air controllers with trustworthy local forces such as the Peshmerga would be one way to reduce civilian casualties and increase the effectiveness of coalition air strikes. We must seek to turn one of these cities and it's surrounding areas into a "Stalingrad" for ISIS, pushing them to the point where they commit totally to a symbolic battle in which their army can be irreparably damaged; by inflicting severe losses on their base of experienced fighters. If IS refuse to deviate from their existing strategy, instead opting to avoid defensive action altogether, then they will lose control of one of their major power centers effectively without a fight. That would be a major propaganda coup for their enemies and deprive them of a substantial portion of their economic base and manpower pool. Putting ISIS between a rock and a hard place in this manner can be no bad thing, but I would expect there to be a good chance of them standing and fighting in place. To avoid such a battle would utterly shatter their aura of invincibility. Of the two options Raqqa is by far the less attractive target. Situated deep within ISIS held territory in Syria, it would probably require a united Syrian force to successfully threaten it and then force IS into a defensive battle. Seeing as there is no real prospect of such a force existing in the near future, Raqqa must be discounted as currently unfeasible. That leaves us with only one real option: Mosul. Mosul, surrounded on three sides in the Northeast by Kurdish forces. Recent Kurdish operations have been focused on the corridor linking ISIS held territory in Eastern Syria to it's Iraqi stronghold in Mosul, with the town of Sinjar falling to a joint YPG/PKK and Peshmerga offensive aided by Yezidi militias earlier this month. In accordance with IS' current strategy, the area was not seriously contested, with estimates of around 700 fighters facing off against over 7,500 Kurdish troops. Even the Kurdish threat to and eventual capture of the logistically important Highway 47 did not force IS to commit it's main strength to the battle. As I've previously outlined I believe that IS will only commit itself to a defensive battle if one of their two major population centers are threatened. The next question which requires addressing is do the Kurdish forces have the will and the capability to conduct such an operation? Clearly convincing the Kurds to engage their forces in a bloody urban battle of attrition, outside their own territory, will be a significant task. In this respect the West at least has it's track record of long standing friendship and co-operation to build upon. ISIS control of Mosul also presents a clear threat to Kurdish territory, acting as their primary base of operations in Northern Iraq. Kurdish leaders and commanders likely understand that sooner or later Mosul will have to be retaken, although their current hopes are probably that such a significant task could be left to the better equipped Iraqi Army to deal with at a later date. However, the now Shia dominated Iraqi Army has repeatedly displayed a profound unwillingness to advance into Sunni majority areas. It's front line is also ~180km further from Mosul than the Kurds, any advance towards Mosul on the part of the Iraqi Army would have to take a lot of time clearing the surrounding areas of resistance. This sort of action would also likely provoke a major attack from ISIS elsewhere, potentially in Anbar province, as they did earlier this year in order to preemptively blunt a similar northward offensive. An advance by the Iraqi Army would therefore be most likely to succeed if it were to fall after ISIS had committed their main strength to Mosul, removing the potential for a major offensive elsewhere. Convincing the Kurds to undertake a major offensive against Mosul would be difficult, but not impossible as part of a multi front offensive involving the Iraqi security forces. More important than the Kurds willingness to conduct an offensive against Mosul is their military capacity to do so. If they lack the necessary military resources to undertake an operation of this scale and complexity then the plan is a non-starter. Estimates on the military resources ISIS commands range from the CIA's conservative 2014 estimate of 31,000 fighters to the Kurds own claims of a force 200,000 strong. More recent reports from 2015 suggest that IS can call upon a force in the region of 40,000 fighters, although it is unclear what proportion of these are tied to garrison and rear echelon duties. Western troops usually require a ratio of 3-1 support to combat troops, but let us err on the side of caution and suggest that the ratio for ISIS is far lower. For the purpose of this exercise I will assume that a third of their troops would be unavailable or unsuitable for combat duties, meaning they can muster 2 combat troops for every fighter engaged in supporting activities. This gives them an estimated total strength of around 25,000 fighters. Their heavy equipment varies wildly in quality and age but IS is thought to have around 170 tanks, 150 armoured personnel carriers and a few hundred armoured cars. These numbers must come with the caveat that they are old, likely out of date, and certainly far higher than the strength they could actually deploy. The estimated number of troops available to the Peshmerga varies wildly, ranging from 80,000 and 200,000. Accurate figures are difficult to come by but a conservative estimate would be that they command around 120,000 troops with a much greater proportion dedicated to rear echelon and garrison duties than IS. For the sake of argument let's say the Peshmerga can field one fighter for every two supporting troops. This would produce a theoretical force of ~40,000 front line combat troops. The YPG and other allied militias could provide a few thousand more, but their equipment and is generally insufficient for much beyond the guerrilla or light infantry duties at which they admittedly excel. While the raw numbers, although sketchy, suggest that the "Kurdish forces" do have a numerical advantage over IS; the numbers alone hide a range of issues that prevent the Kurds from putting such a force in the field. Firstly the political divisions within the Peshmerga are a major stumbling block, the 36 brigades are all independently controlled and many are aligned with the PUK, KDP and KRG factions. Although there have been efforts to unite these forces under a single unified command to fight IS, progress has so far been slow. Similarly, these politically divided brigades often struggle to cooperate with one another. Heavy equipment is another area where the Peshmerga has weaknesses. They actually do possess a sizable number of armoured vehicles and heavy artillery pieces, mostly ex - soviet, seized from the Ba'athist army's stockpile during the 2003 Iraq war. 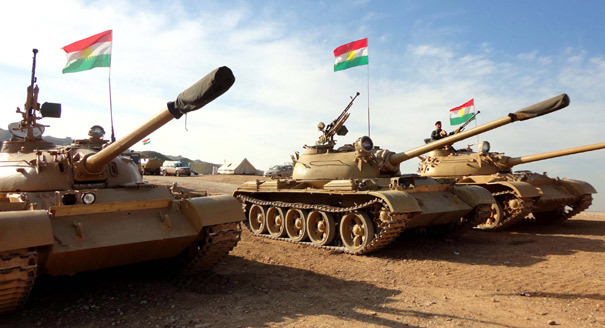 In total the Peshmerga have over 500 tanks and around 200 armoured personnel carriers. The lack of spare parts and ammunition, however, prevents most of it from being made available for front line use. Another problem is that, for the size of their forces, their logistical support structures are woefully inadequate. Conducting protracted offensive action will absolutely require a far more robust and effective logistics network backing it up. Several of the highlighted areas of weakness can be remedied with outside help. Russia's recent commitment to directly combating IS makes the task of sourcing spares and ammunition for much of the Peshmerga's heavy equipment a more straightforward exercise. If the Russians refuse to cooperate then all of the required parts and ammunition are still readily available on the international market, but accessible only to state buyers. The US Army has over 30,000 M939 utility trucks currently set for disposal, transferring a portion of these to the Kurdish forces would go a long way towards solving some of their logistical problems. Importantly both these solutions avoid arming the Kurds with modern equipment that would allow them to challenge Iraqi government forces at a later date, supplies of ammunition and spare parts could easily be cut off after the conflict, to limit their potential for armed secession. 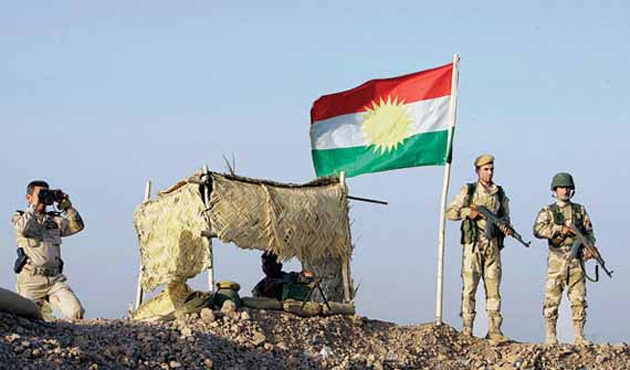 The politicised nature of many of the Peshmerga brigades, and lack of a unified command structure, are far more intractable but not insurmountable problems. Significant but slow progress has been made towards a unified Peshmerga command structure, a series of defeats and blunders fighting IS has made it clear that a more unified effort will be necessary to successfully combat ISIS. I would advise that if the Kurdish regional government manages to implement a functional unified command structure then the West should equip them with the spare parts and ammunition they need to deploy their existing heavy equipment and take the fight to IS around Mosul. If it is made clear that supplies will only come once the Kurds implement a workable unified command it could give the initiative the impetus it needs to be put into place. The Peshmerga would very likely have an overall and local numerical advantage over IS, especially considering that the Islamist group would be taking an enormous risk if it concentrated a very large portion of it's strength on the defence of Mosul. As Operation Free Sinjar has demonstrated, the Kurds do seem able to concentrate the large forces necessary to execute complex urban assault operations. A battle for control of Mosul would be on an entirely different scale however, without their heavy equipment and a unified command it would be an enormously risky and costly undertaking; even with the Iraqi Army moving up from the south. It does, however, remain the best possible chance for anti-IS forces to inflict irreparable attrition to their trained fighters and prestige. In summary, IS is militarily easy to contain. The difficulty lies in dislodging them from the territory they hold because of their strategy of harassment rather than static defence and continuous offensive action directed against their enemies weakest points. Despite this, I believe their commanders are acutely aware that their strategy would collapse if they were to lose enough of the trained field army to prevent their offensive action from being successful. This cannot simply be achieved by blunting their offensives, leaving them free to withdraw at will and attack elsewhere. In order to inflict the necessary damage they must be forced into conducting a static defensive battle that they do not wish to fight. The only way of doing this, in the author's opinion, is by seriously threatening one of their two major centers of power: Mosul or Raqqa. As there are currently no forces on the ground capable of conducting an offensive towards Raqqa, Mosul is left as the only realistic option open to us. While the Iraqi army is the better equipped force, they will remain unable to concentrate the force to advance northwards with IS threatening their flank in Anbar province. It will therefore have to be the geographically closer Kurdish forces which initiate the battle and begin the process of drawing IS reserves into the city before the Iraqis can advance, certain that those reserves couldn't be employed for offensive action against their Western flank. In the meantime the West needs to help the Kurdish forces build the logistical support structures necessary for them to conduct protracted offensive. The West must also seriously encourage the establishment of a functional unified command, possibly using the delivery of spare parts and ammunition for their existing heavy weapons as an incentive to do so. Defeating IS is a matter of making their current military strategy for Iraq and Syria unworkable. This can only be achieved by forcing them to fight a battle that will result in the fatal degradation of their fighting power. I believe an attack on Mosul, coordinated in the manner I have laid out, could achieve this without the need for large Western conventional forces.